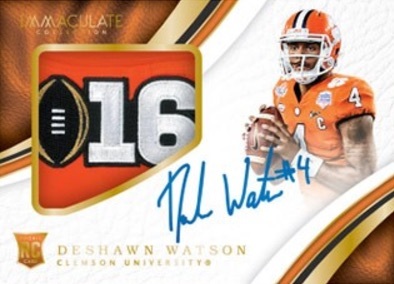 Turning the spotlight on the early years for top NFL stars and rookies, 2017 Panini Immaculate Collection Collegiate Football maintains the premium brand in a college setting. This includes five autographs or memorabilia cards per box to go along with one base card (or parallel). The 2016 set also promised at least five hits. Offering only 25 cards, the small base set is limited to just 99 copies. However, there are Gold (#/5) and Platinum (1/1) parallels in play, as well. Collectors can find one of these non-hit cards in each box. The quality inserts form the majority of the product with five in every 2017 Panini Immaculate Collegiate Football hobby box. 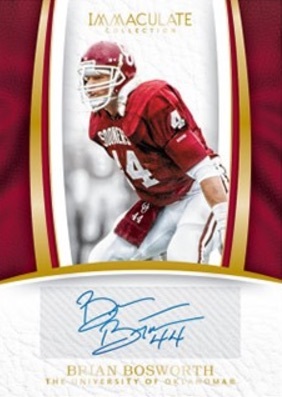 Honoring Hall of Fame players from both college and pro circles are the main Autograph and Immaculate Ink cards. 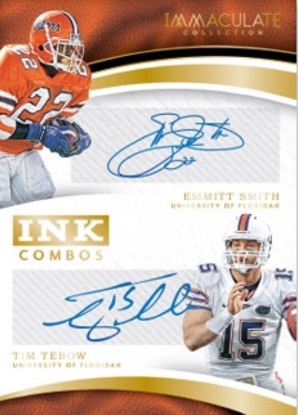 Immaculate Ink is also noteworthy given the hard-signed aspect. Increasing the signers are the Ink Combos dual autograph inserts. Searching for the next crop of gridiron stars, the 2017 NFL rookie class is on full display with on-card Rookie Patch Autographs, Immaculate Signature Rookie Patches and Premium Patches Rookie Autographs. Making their debut are the prime Bowl Conference and Championship Logo patch parallels. 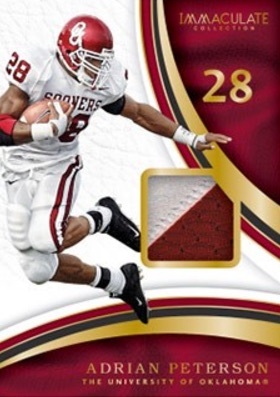 Among the relics available in 2017 Panini Immaculate Collegiate Football, Immaculate Numbers Memorabilia is limited to the player's college jersey number. Trios Relics, as the name suggests, puts three players on one card with gear from each. There are also Brand Logos, Laundry Tag Brand Logos, Laundry Tag Team Logos and Team Logo Shields inserts. 2017 Panini Immaculate Collegiate Mitch Trubisky RC Patch Auto #10 99-JERSEY #! 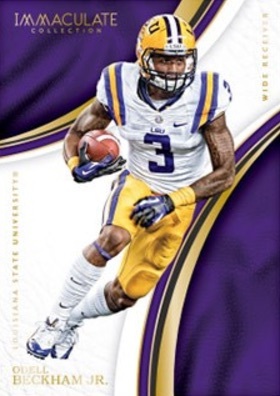 View available 2017 Immaculate Collegiate Football cards on eBay. PARALLEL CARDS: Red #/30, Blue #/10, Gold #/5, Platinum 1/1. PARALLEL CARDS: Prime #/10 (Hirsh, Sayers, Taylor, Mariota, Bradshaw - 1/1*). All subjects not included in Prime parallel. View specific options with the full spreadsheet. PARALLEL CARDS: Blue 1/1, Gold 1/1, Platinum 1/1. THOMAS RAWLS PARALLELS: Blue #/10, Gold #/5, Platinum 1/1. PARALLEL CARDS: Gold #/25, Bowl Logo #/10 or less, Championship Logo #/5 (Only Williams/Watson/Stewart), Brand Logo #/5 or less, Brand Logo Tag (Only Kupp 1/1; Darboh #/5), Team Logo Shield #/5 or 1/1, Team Logo Tag (Only Kizer 1/1), Conference Logo 1/1, Platinum 1/1. All subjects not included in parallels. View specific parallel numbering with the full spreadsheet. PARALLEL CARDS: Gold #/25 or #/10, Bowl Logo #/10 or less, Brand Logo #/5 or less, Championship Logo #/5 (Only Williams/Watson), Team Logo Shield #/5 or 1/1, Brand Logo Tag 1/1 (Only Kupp), Conference Logo 1/1, Platinum 1/1. PARALLEL CARDS: Gold #/25, Bowl Logo #/10 or 1/1, Brand Logo #/5 or 1/1, Brand Logo Tag #/5 or 1/1, Team Logo Shield #/5 or 1/1, Team Logo Tag #/5 (Only Hunt/McGuire), Championship Logo #/5 (Only Scott/Gallman/Howard/Leggett), Conference Logo #/5 or 1/1, Platinum 1/1. PARALLEL CARDS: Team Decals #/21 or less, USA Flag 1/1. 33 cards. Serial numbered #/20. PARALLEL CARDS: Numbers #/25 or less, Team Logos #/15 or less, Bowl Logo 1/1, Championship Logo 1/1, Conference Logo 1/1. 1 card. Serial numbered #/25. 33 cards. Serial numbered #/8. PARALLEL CARDS: Team Logo #/6 or less, Button #/3 or less, Brand Logo #/2 or 1/1. I feel like everything in the set looks great. However, poor packaging does lead to some rough cards. Also, the player worn stuff is just a bit much. Yeah, you might of had him “put on” and under armour gloves, but like someone else said, NC is all Nike (at least to my understanding). Can’t complain too much though, the patches do look awesome.